Preamble rant... Seeing shows in NYC is kind of a pain. Brooklyn Steel is less than 5 miles from my apartment, but it takes about an hour to get there via public transportation...especially when the MTA changes the subway routes/schedules due to weekend work. 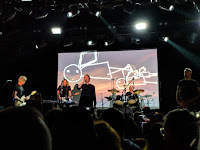 Between that and my poorly picked spot in the crowd standing behind a group of giant (plausible basketball or volleyball player) dudes and next to a couple of groups of pot-smokers, the show started off with me feeling that I was getting too old for this concert-going business. But after a good show and a fairly breezy journey home (pretty good timing on the subway, which was running the normal route by then), my mood has improved. But not enough for a lengthy post - it's still pretty late. 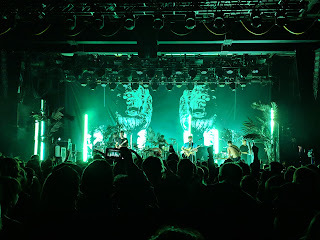 I will give props to Foals for playing a lot of their older classics (though only one of my favorites) along with most of the new album (which is pretty strong, though a bit of a change in style). Speaking of which, the new songs came off well. They had lots of energy, and I think an extra couple of performers on stage. Good stuff. Following a previous down year, 2018 was the downest of years in music for me. According to my Last.fm statistics, I listened to less music in 2018 than I had in any other year since I joined the service in 2007. These days my commutes are dominated by podcasts (I keep adding new ones, and have a hard time keeping up with the stream of episodes), and I can't really get into listening to music while at work. So my music listening is mostly relegated to a bit of the time spent on my computer at home or on the weekends. I still try to keep up with some of my usual avenues of discovering new music, but I seem destined to be stuck in the past in terms of music appreciation; who knows whether that will change at all this year. Mike Birbiglia's new comedy special has a 3+ month long stint on Broadway - a pretty amazing accomplishment. And I think the show is deserving of it. I didn't know anything about the show going into it, and I'm not sure if that made it fresher or not. You can read reviews about it online (e.g., this one) if you want to know more, but that may (or may not) spoil a couple of the surprises. I'll just say that Mike really hits his stride doing his trademark autobiographical story-telling with plenty of funny anecdotes and a couple of profound moments mixed in. I really enjoyed it, and Fran was in stitches the whole time. Tonight's event actually had a bit of a backstory. It was originally supposed to be a conversation between Steven Pinker and Matt Dillahunty, and was promoted by Pangburn Philosophy. However, that company folded about a month ago, so the event was cancelled along with several others. Everything I have read and heard on the matter thus far indicates that Travis Pangburn was a fraudster who swindled both speakers that he had recruited and customers who had bought tickets for the events. I should note, though, that although I knew about Pangburn ceasing operations, I didn't actually realize until last week that this specific event had been cancelled - it seems Pangburn didn't send out a notice to ticket-holders who had acquired tickets through his site. And of course he wasn't providing refunds - the purchase confirmation notice says "No Refunds & No Exchanges. All Sales Are Final.". 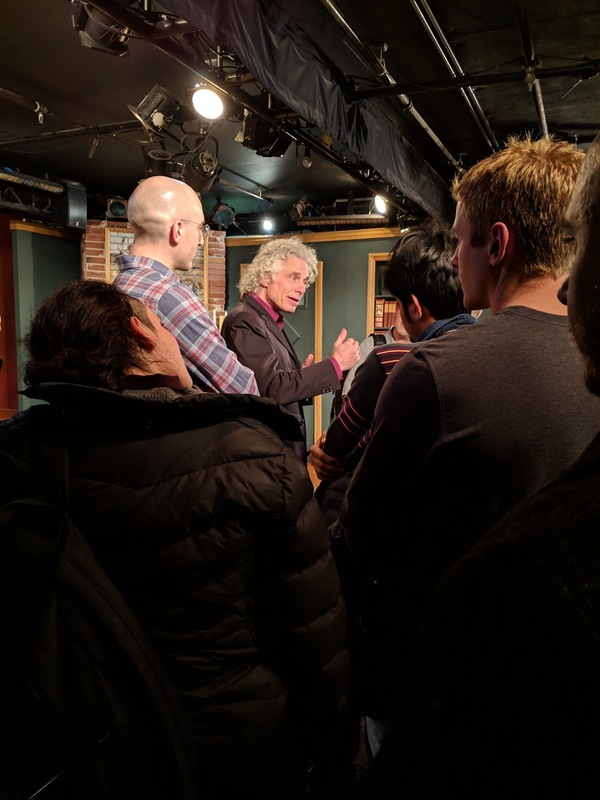 Luckily, I saw Steven Pinker's retweet last week of this make-up event, with tickets being made available for *free*; so I jumped at the chance. The event was held in a small theater on Broadway - I would guess it seated about a couple hundred people (though I'm terrible at these sorts of estimates), in contrast to the ~1500 at the originally scheduled venue. Prior to the start, I noticed Steven and John chatting right next to the audience, and attempted to go say hello (as it seemed that a couple of other people just had); but the organizer (Jay Shapiro) stepped in, saying that there would be time for that afterward, as they were about to begin. The talk was moderated by Shapiro, and consisted of about 30 minutes on linguistics, maybe 30 more on progress denial, and then another 45-ish more on audience questions. Steven and John are both obviously brilliant guys, and pretty much agreed on everything that was discussed. I can't say that I have any familiarity with linguistics, but some of the discussion on that topic was pretty interesting. They dished on theories of the relationship between language and human thinking, a bit of what Chomsky got right and wrong, and other things that I can't remember. Unfortunately, though, I also don't remember either of the couple insights that I found particularly interesting at the time. 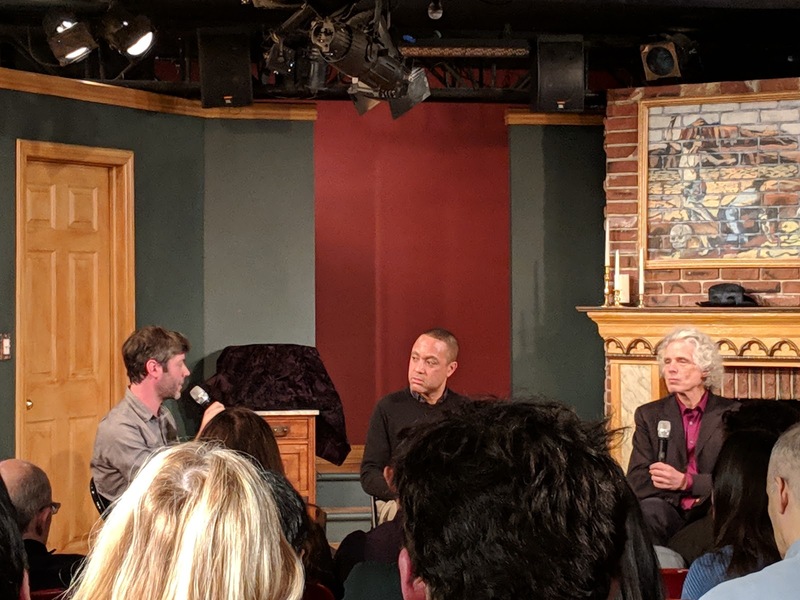 After Jay transitioned them to ideas on progress and its denial, they discussed Steven's books on the subject, as well as John's categorization of many social justice proponents on the left as adhering to a religion. I found that last bit particularly interesting (the rough outline is that such social justice proponents react strongly against reasonable arguments that don't adhere to their worldview in a dogmatic way similar to religion), and will try to spend some more time with his thoughts on that matter. After the talk, I hung around a bit to take advantage of the intimate setting and try to meet the speakers. I was fortunate enough to separately briefly chat with John, Steven, Jay, and Coleman Hughes (who was in attendance and had the first audience question). I delivered a message from Fran to Steven telling him to keep up the good work and that she thought that his curls were almost as awesome as hers - he was happy to hear that last part. I also got a little more background from Jay and John about how they hurriedly put the event together at the last minute. All in all, it was a pretty cool event, and a nice way to end a birthday. I had mixed expectations going into this show, so I'm not too disappointed that I didn't like it more than I did. Thom is (obviously) a musical hero of mine - both because of Radiohead and much of his solo work. I knew this wouldn't be like the shows he did as a band with Atoms for Peace, but wasn't sure how much this would be like a DJ set. In the end, it was somewhere in between. 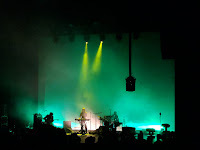 There was a lot of head-down button-pressing and knob-twiddling, but both Thom and Nigel did break out guitars for quite a few songs (plus a couple on keyboard for Thom). Thom was also pretty animated, often dancing in his trademark awkwardly entertaining style. Despite that, it's hard to give many points for performance during this show. I didn't really like many of the new songs, and I might even go as far as to say that some of the ones that I knew were a ruined a bit by the new overly-electronic stylings and improvisational singing - "The Clock" being a prime example of this. Seemingly every song had a newly conceived camouflage of an intro (and some also an outro), which were on the whole hit or miss - mostly miss. There were definitely some highlights, though, including new tune "Not the News" and an excellent rendition of "Default". Thom definitely still has some great pipes (as displayed during "Atoms for Peace" and "Suspirium"), even if he sometimes seems like he'd rather not try. One might conjecture that his age showed a bit when he hilariously forgot a couple of lines during "Truth Ray", but I've known him to do this type of thing for a while. 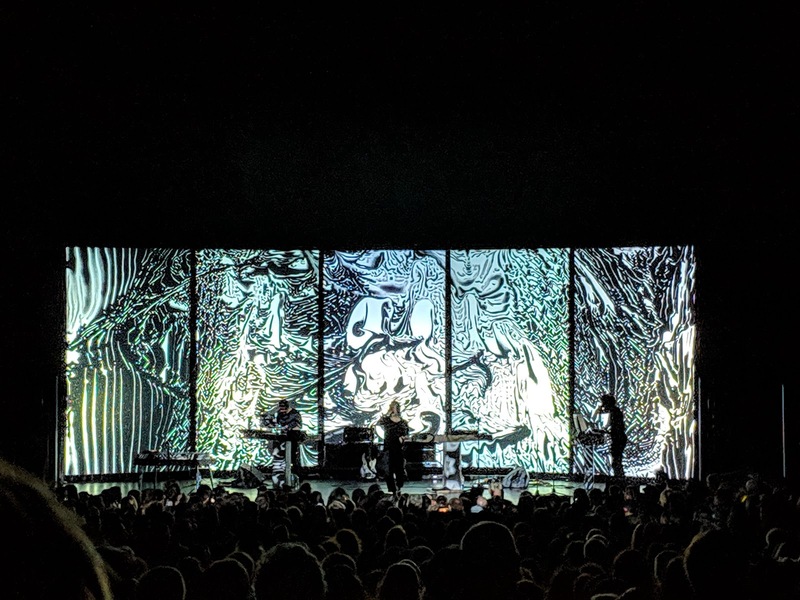 I would be remiss if I did not point out that the visuals on the backing screens were pretty spectacular the whole show. 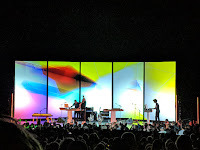 I'm probably being too harsh on this concert, though - mostly because I'm such a huge fan of Thom's work. Despite the low-ish rating, I did enjoy a lot of it, and wouldn't dare ask for my time or money back. 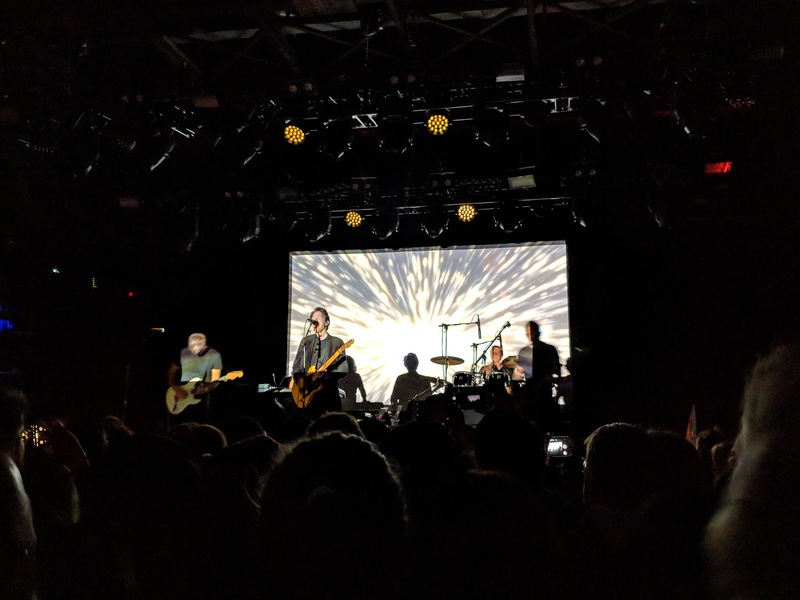 This show (and tour) was a 15th anniversary celebration of Mew's breakout album, Frengers. 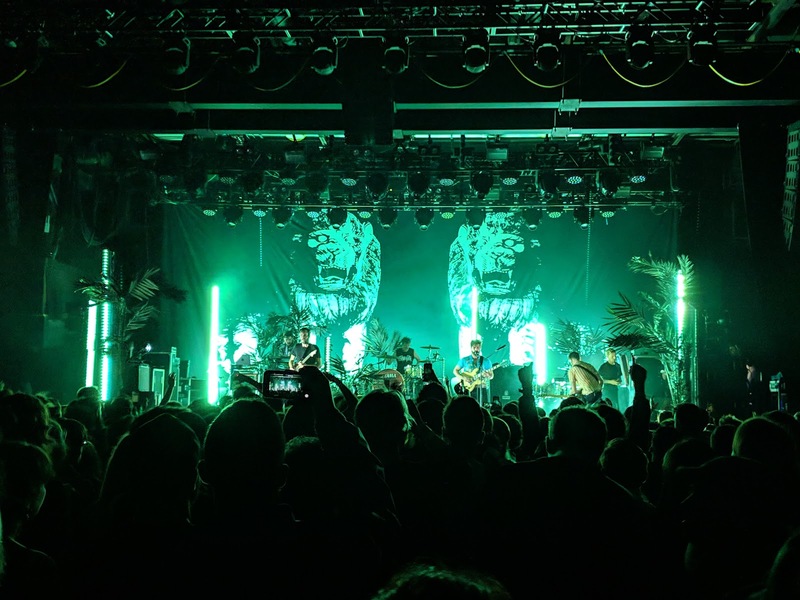 As such, the last half of their setlist was dedicated to playing the album in order. Interestingly, they took a 10 minute intermission between the first half of the set and the Frengers portion. 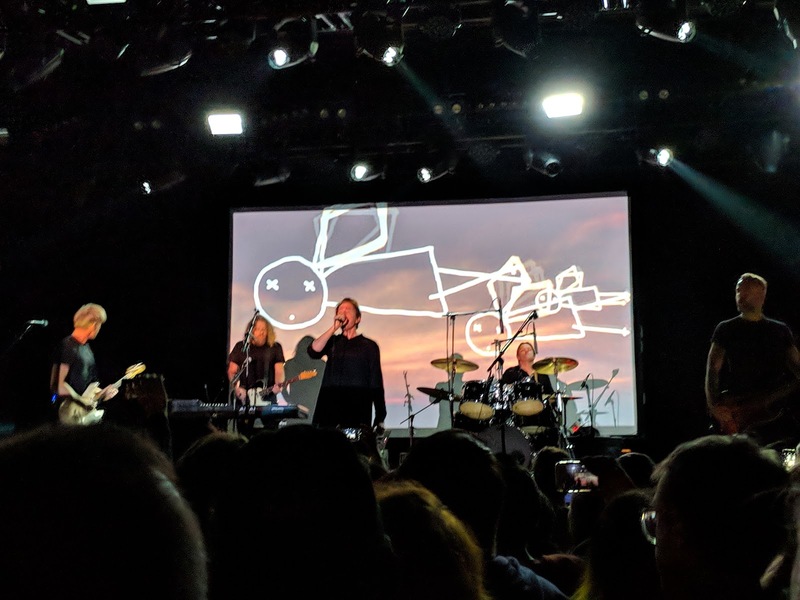 Unfortunately, I got my timing a little wrong (and the weekend MTA closures didn't help) and didn't make it to the venue until Mew was on their second or third song (based on what what someone answered when I asked; not sure since I can't find the setlist online). It was nice to hear all of Frengers (admittedly a strong album), but I would have liked to hear more of their newer stuff. They also played one old song, "King Christian", that I wasn't familiar with. Side note: Jonas is still one of the least animated front-men around; but that's fine as long they play good tunes and he belts out that falsetto. 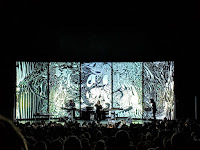 Update (10/16/2018): The setlist has been posted and I apparently missed two of their best songs to start off the show. So my complaint about hearing newer songs is kind of on me. 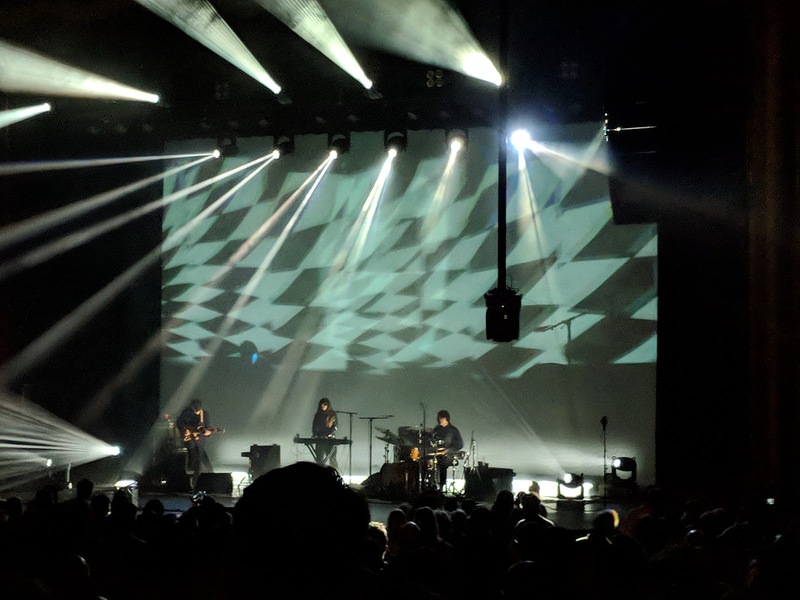 I considered not going to this show because I injured myself playing soccer 3 days before and was still limping around (the injury happened on Sunday, and I worked from home Monday and Tuesday); plus I've seen Beach House several times before. I'm glad I decided to use my ticket, though, as this ended up being probably my favorite of the times that I've seen them. This was surprising because I think the album that they put out this year (7) was a little weak. The new tunes didn't drag down the setlist too much, though, and a couple were even standouts. "Lemon Glow" (my favorite from the album) was a stunning closer for the main set, and "Dive" was a solid way to end the evening. 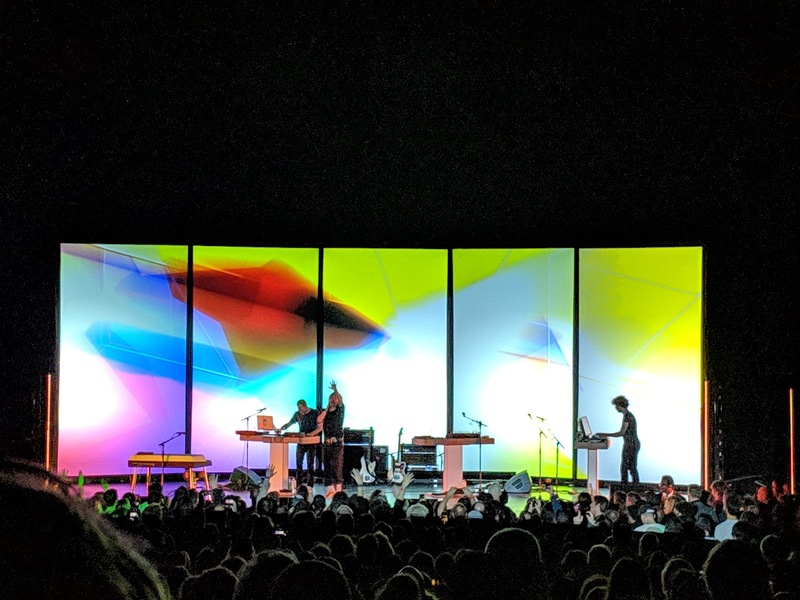 Something about the live rendition of "L'Inconnue" made it also noteworthy for me, and my second fave from the new album, "Dark Spring", didn't disappoint either. Of course they also threw in enough classics to keep us happy. And "Levitation" - one of my top songs from my favorite album of theirs - was a great way to start the show. I would have liked to hear some more of my favorite songs of theirs, but I guess those songs probably aren't their most popular ones. 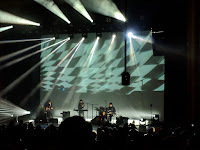 They did bump up the production value of their light show a bit, but maintained their standard perform-in-the-shadows style (the two pictures above were chosen because they are the most lit that the band members ever got - they are not representative of their lighting for most of the show). Based on their comments, they enjoyed the energy of the crowd, which was mostly standing despite the theater environment. All in all, a high quality concert.